Frederick Douglass, ca. 1879. George K. Warren. Photo: National Archives and Records Administration/Wikipedia. Few people passing through Baltimore’s Fell’s Point neighborhood ever step onto the 500 block of South Dallas Street. The narrow street is really a glorified alley just wide enough to accommodate a single lane of one-way traffic and two single-file sidewalks. No businesses are located on the block. Less than 500 feet away around a corner, the sights and sounds of a regional bread company’s production facilities dominate the neighborhood, overshadowing everything in the vicinity. Plaque on Douglass Row. Photo: Author. 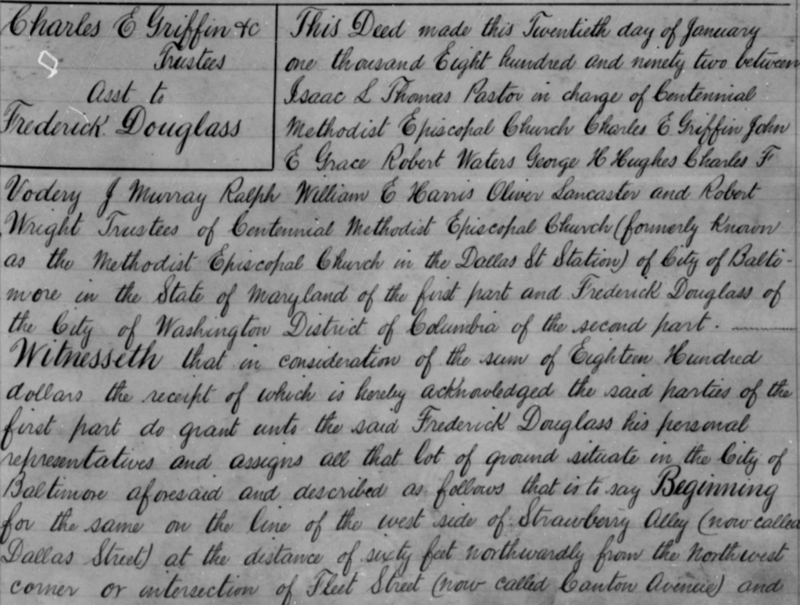 Almost as an afterthought, a single sentence appears at the end of the marker to explain Douglass’s connection to the block. At the ripe age of 74, Douglass bought a plot of land on 516–524 South Dallas Street in 1892 and proceeded to construct a row of five houses to lease to renters. Douglass’s foray into real estate development may seem like a surprising turn for the legendary freedom fighter. 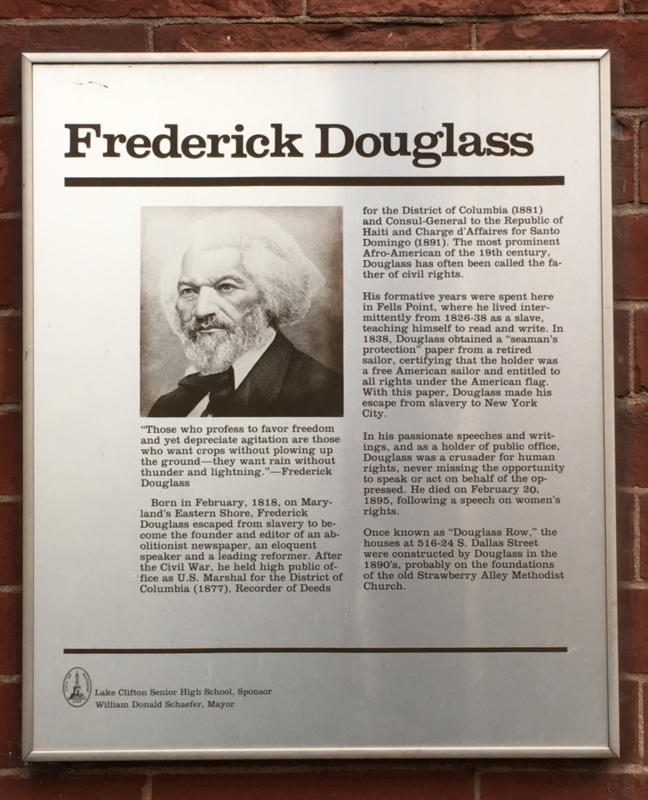 But the history of the five homes marks a fitting end to Douglass’s time in Baltimore, embodying his remarkable personal transformation from property to property-owner. 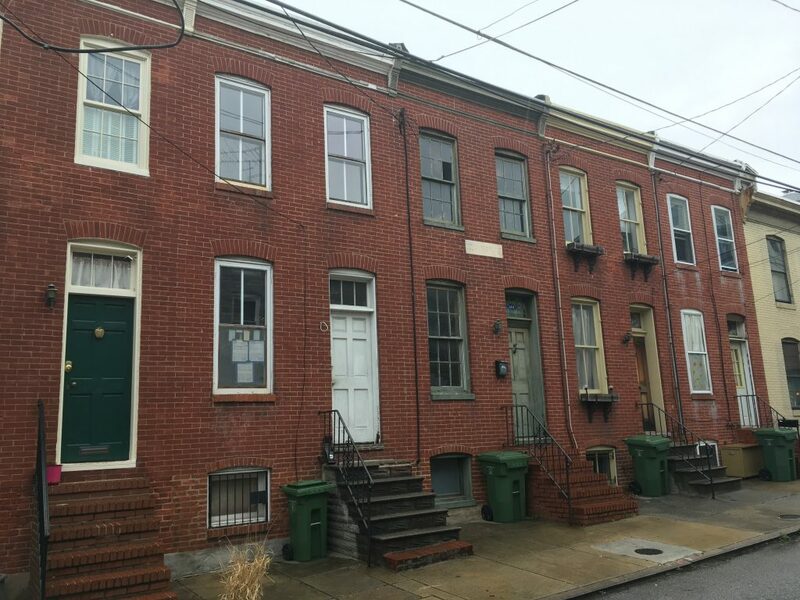 Indeed, the houses on Dallas Street—which became known alternately as Douglass Place and Douglass Row—represent the most meaningful (and possibly only) extant property in Baltimore with a direct connection to Douglass. Douglass was twelve years old when he began frequenting the 500 block of Dallas Street, originally known as Strawberry Alley. In 1831, he joined a “new Sabbath school for black children” at the Strawberry Alley Methodist Church, a house of worship founded in 1773 with two congregations, one white and one black.2 In 1865, long after Douglass left Baltimore, the two congregations split into separate churches. In 1876, the black church moved to a larger building on the nearby corner of Bank and Caroline Street. Douglass Place at 516-524 South Dallas Street, Baltimore. Photo: Author. But Douglass never forgot the congregation of Strawberry Alley. In September 1891, he returned to the expanded and relocated church, now called the Centennial African Methodist Episcopal Church, where he recounted that “whatever successes have come to me in literature, in statesmanship, in learning the light and inspiration was first gathered in the old church in Strawberry alley.” Douglass fondly recalled “the little, unpretentious house in which we used to gather,” a century-old building that the Baltimore Sun had described as “dingy and out of repair” several years earlier.3 Douglass’s fond words about the building may have been his way of expressing interest in purchasing the property. Just four months later, in January 1892, officials from Centennial sold the building and ground to Douglass. Deed for 516-524 South Dallas Street, 1892. Photo: Maryland State Archives. Douglass had the Strawberry Alley church building demolished soon after purchasing it. On its site he commissioned the construction of a row of five modest houses. Each of the two-story houses measured just 902 square feet. More recent accounts of these properties contend that Douglass conceived of the properties as a form of low-cost housing to benefit impoverished black families, but primary sources are more ambiguous about the aging abolitionist’s motives. Douglass, however, wanted to rent out his houses, not sell them. Financial gain was at least partly his goal. 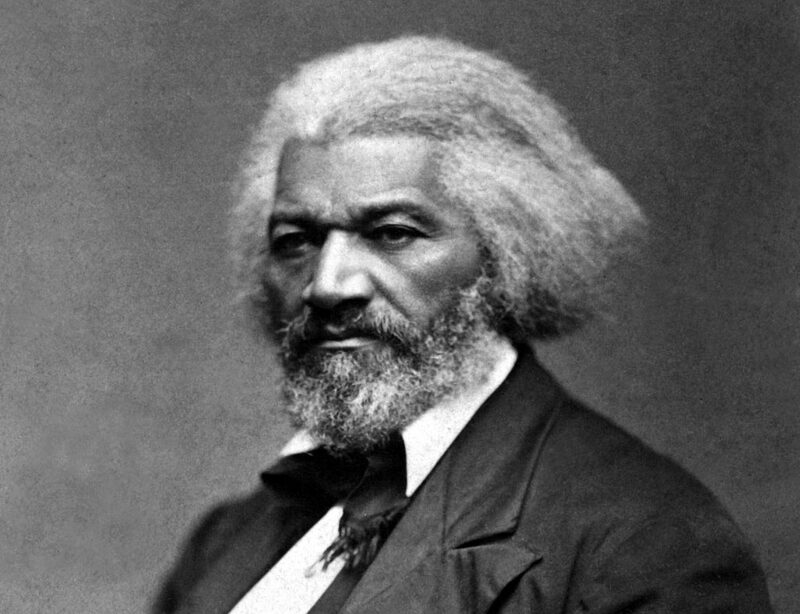 Yet within a year, Douglass’s property manager in Baltimore, Charles R. Bodrey, wrote him to report that “on account of the stringency of the times it is very hard to collect money here now.…Two of the houses are now vacant.”5 The national financial panic of that year could not have come at a worse time for Douglass. Whatever his motives, Douglass did not live long enough to see the properties appreciate significantly. Three years after purchasing the land on South Dallas Street, Douglass passed away on February 20, 1895 at the age of seventy-seven. One thing that is clear about Douglass Place is that it did not attract only African Americans. A city directory shows that blacks resided in just one of the five houses by 1901, while whites, some of them Polish immigrants, inhabited three of the homes. 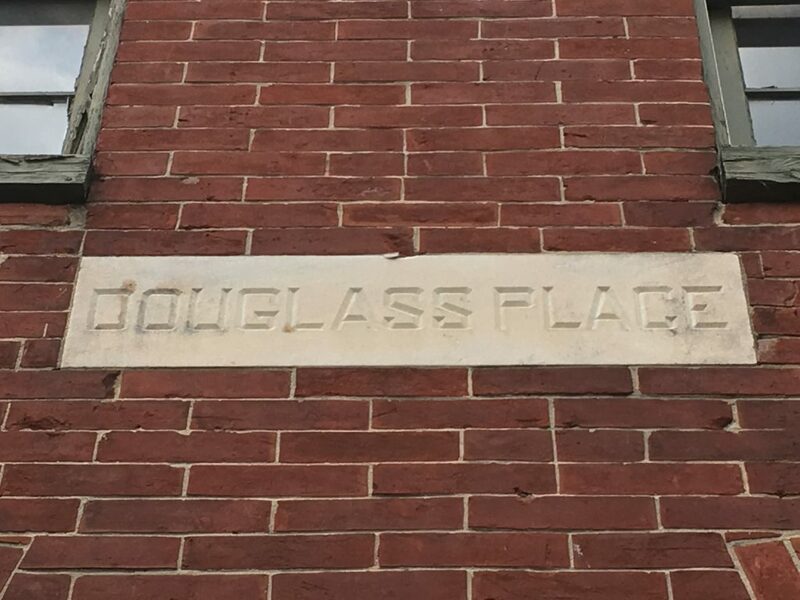 At the height of Jim Crow, Douglass Place was a multiracial housing development. Just ten years later, the city of Baltimore would enact the first municipal law in the United States mandating racial segregation in housing. Marble marker, Douglass Place. Photo: Author. In 1982, two residents of 520 South Dallas Street successfully applied for the five houses of Douglass Row to be listed on the National Register of Historic Places. Most of the homes are still inhabited today. An undated marble carving on house 520 marks the small row as Douglass Place. In January 2016, the one-bedroom house at 525 sold for $145,000. The sale listing on Redfin.com featured a slideshow of the home. If not for the plaque on the property’s exterior and a small portrait displayed on a fireplace mantle, nothing about the short, narrow house would suggest that it had been built by one of the greatest activists and political thinkers in American history.